We stood up for what we believe in – and they arrested us for it. On September 4, 2014, over 500 striking workers were arrested in cities across the country. So many workers struck in Detroit that the cops had to stop arresting people – they ran out of handcuffs. 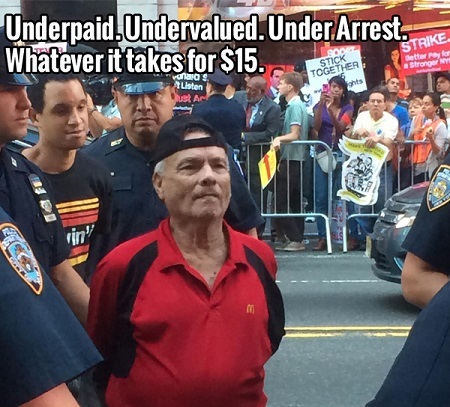 One of these arrested workers was 81-year old José Carillo, a McDonald’s maintenance worker in New York City, arrested for civil disobedience in front of the Times Square McDonald’s. Even though he works as much as possible, José says he wouldn’t be able to take care of himself without food stamps and Medicare. That’s why he’s committed to doing whatever it takes for $15 an hour for his younger co-workers, who are struggling to raise families and survive. Post by Low Pay is Not OK.